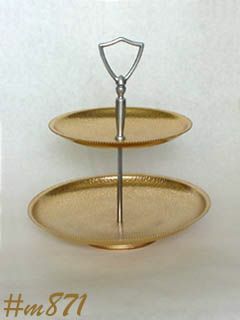 This is a very nice vintage aluminum tid bit tray! It has 2 "plates" -- large one measures 8 5/8" diameter, the other measures 6 1/2" diameter. It is in a very pretty gold color and has a nice texture/design. Mint condition -- looks new!